Spon Lane Junction, between the Old Main Line and Spon Lane Locks, is an intimidating place to start. The M5 looms above and you're surrounded by huge supporting pillars, the 20th towering above the 18th century. The canal and motorway now start to play cat and mouse and, at the Stewart Aqueduct, the Old Main Line, New Main Line, West Coast Main Line and M5 are all adjacent, reflecting canal mania, railway mania and present day road mania. Still directly underneath the motorway, Oldbury Locks are reached where Thomas Clayton were based before the M5 arrived, and the Titford Canal departs for Titford Pools 2½ miles away (see Titford Canal walk). The outlook continues to be unremittingly urban, with modern factories or rather 'industrial units' as far as the eye can see. The towpath deteriorates and you can tell that this is the Wild West (Midlands) by boats flying the jolly roger. After crossing Seven Stars Bridge, on the far side of the canal there's the remaining stub of the quarter mile long Houghton or Chemical Arm and Valencia or Valentia Wharf. The arm was once used by boats carrying materials and waste to and from Albright & Wilson, Chance & Hunt and other chemical works, where all kinds of nasties were manufactured including phosphorous, ammonia, cyanide and TNT. It's now mostly filled in but the surrounding land contains so much toxic waste you wouldn't want to light a match anywhere near it! For many years, 1951-1997, the wharf was the site of Les Allen's boatyard and was part of a cluster of five basins opposite the start of the former Oldbury Loop. With the exception of the odd housing estate, the landscape which once featured many clay pits and brick works remains unexceptional until Brades Hall Junction where the Old Main Line meets the Gower Branch. Just over ½ mile further, Tividale Aqueduct takes the canal over the Netherton Tunnel Branch. Here you have to descend the embankment and go left towards the tunnel whose northern portal is under ½ mile away. 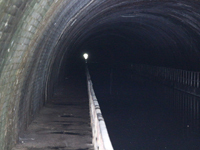 Regarded as the last 'proper' canal tunnel to be constructed, the Netherton Tunnel was built to relieve congestion through the parallel Dudley Tunnel which was choked with traffic. It has the largest bore of any canal tunnel with towpaths on both sides and was completed in 1858, having taken just under two years and 53,000 cubic yards of puddling clay to construct. It's 3027yds long and, although originally lit by gas and then electricity, very dark. The only intermittent light comes from the seven remaining ventilation shafts. The towpath can be very wet, in places like a stream. The spot of light in the distance doesn't get larger very quickly but at last you get to the other end and emerge near Windmill End Junction with the Dudley No.2 canal. Years ago the outlook was similar to rest of the Black Country, and the Cobb Engine provides a clue, but there are now nature reserves instead of collieries. If your want to continue through Bumble Hole Nature Reserve to the famous Ma Pardoe's pub, refer to the Coombeswood – Black Delph walk.